Just about any trikes can be electric-assisted trikes. Internationally recognized brands like Bionx and Shimano STEPS can be retrofit or specified on trikes. There is a whole zoo assist kits available, and we’ve worked with a few of them. You get what you pay for. The electronics in them often aren’t as simple and bombproof as we’d hope. 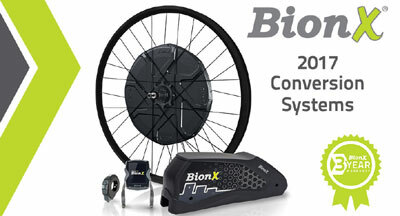 However, companies like Bionx and Shimano will support their product. Like it or not, electric assist is a whole different ball of wax. We can’t really fix any of it, but we can troubleshoot problems and replace hardware. We can also reprogram system parameters and update firmware. Only recently has a major trike maker offered a factory-made electric assisted trike. They show up with hardware set up for carrying the battery and motor parameters pre-programmed for the trike: the TerraTrike Rambler EVO. Even so, the EVO is still basically a conversion at this point — a regular Rambler with stuff attached to it. The greatest benefit of a factory-built e-trike is price. The EVO cost about $1000 less than taking a similar conversion kit and putting it on a Rambler. Another great benefit is reliability. Much more can go wrong on an assisted trike. When they are all getting stamped out on a production line there will be more uniformity, a more experienced and skilled installer, and a ready supply of spare parts.